These merry little Christmas deviled eggs are so cute, so festive and incredibly tasty! All you need are a few pink pepper corns and a few parsley leaves to make these jolly appetizers. My Christmas decorating weekend has arrived! It’s officially December, so it’s time to start listening entirely to Christmas music, watching Christmas movies on a loop and making crafty and tasty little treats for friends and family (but especially, myself). I’m starting with merry little Christmas deviled eggs for my evening snack… but before you start to panic, don’t worry. I did not garnish my deviled egg with a poisonous berry! They’re simply pink peppercorns (which are really red). 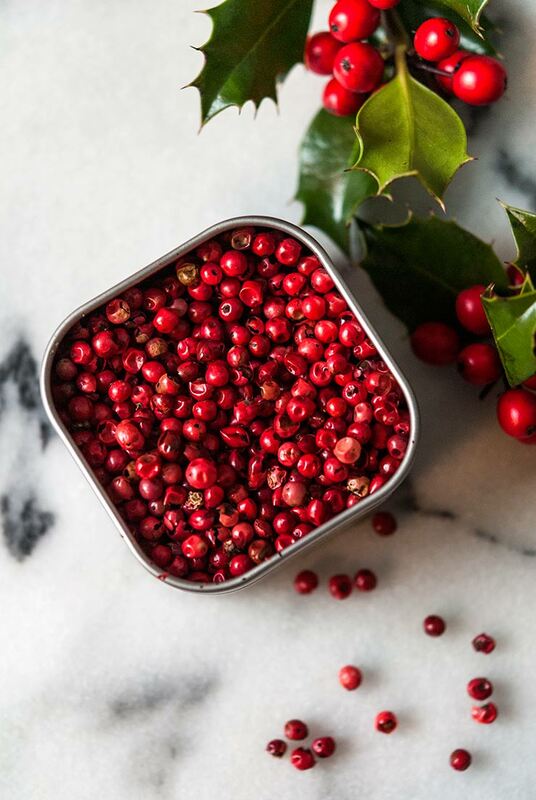 Pink peppercorns look like tiny holly berries, so they’re a perfect garnish for any yuletide appetizer. And they’re actually pretty tasty whole, unlike black peppercorns, so your guests need not pluck them off. 1. Don’t use more than 4 pink peppercorns. Again, they’re not unappetizing whole, but a big bunch of them is a little overwhelming. Less is more. 2. 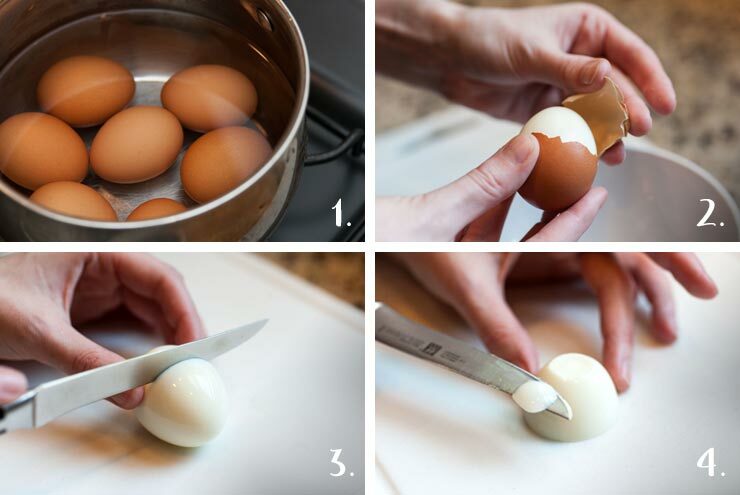 Make sure not to fill your eggs until a half hour, to an hour before you serve them. The filling tends to dry out and starts looking quite un-appetizing after an hour, even if they’re in the fridge. 3. Pretty please, use a pastry piping bag to fill your eggs. It makes SUCH a difference! 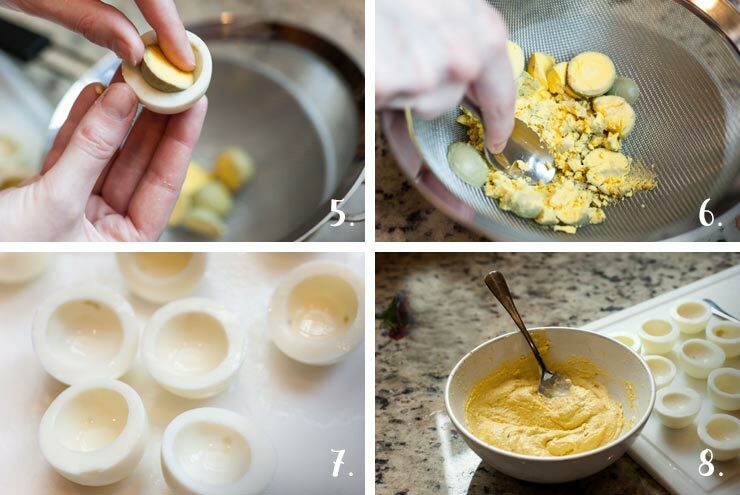 It doesn’t matter how tasty your deviled eggs are, if the filling is scooped in with a spoon, they won’t taste nearly as nice as when they look professionally piped. Where can I find pink Peppercorns? They can be a little tricky to find in regular food stores, so I found my pink peppercorns on Amazon. You can also find them in specialty spice stores. 8. In a small mixing bowl, mix your egg yokes, 1 tbsp. mayo, 1 tsp. sour cream, 1½ tsp. spicy brown mustard, tiny sprinkle of nutmeg and sprinkle of salt & pepper to taste. The measurements of mayo, sour cream and mustard are purposely on on the light side so you can customize your texture until perfect. Your consistency should be similar to hummus so give it a taste, and see which sauce you would like to make it a bit more creamy. 10. Garnish with a few pretty peppercorns and parsley. You can also give them a little sprinkle of paprika or nutmeg, but if you do, make sure to put the spice in your hand and sprinkle, rather than sprinkling directly from the bottle – otherwise you risk over-spicing your pretty little eggs. 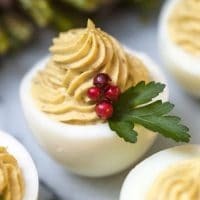 These merry little Christmas deviled eggs are so cute, so festive and incredibly tasty! All you need are a few pink pepper corns and a few parsley leaves to make these jolly little appetizers. In a small mixing bowl, mix your egg yokes, 1 tbsp. mayo, 1 tsp. sour cream, 1½ tsp. spicy brown mustard, tiny sprinkle of nutmeg and sprinkle of salt & pepper to taste. The measurements of mayo, sour cream and mustard are purposely on on the light side so you can customize your texture until perfect. 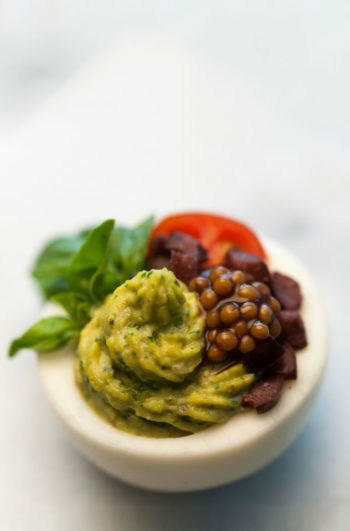 Your consistency should be similar to hummus so give it a taste, and see which sauce you would like to make it a bit more creamy. Once your ingredients are mixed, add your mixture to a pastry piping bag with a nice tip and fill your pretty, little eggs. Garnish with a few pretty peppercorns and parsley. You can also give them a little sprinkle of paprika or nutmeg, but if you do, make sure to put the spice in your hand and sprinkle, rather than sprinkling directly from the bottle – otherwise you risk over-spicing your pretty little eggs. Again, make sure NOT to use real holly berries for your deviled eggs. Real holly berries are not edible like pink peppercorns.